Penicillin is a chemical produced in common molds which has potent antibacterial properties. Bacteria are tiny organisms that have the potential to cause a huge variety of infections in every organ system of the human body. The accidental discovery of penicillin in the twentieth century may be one of the greatest milestones in medical history. Penicillin opened the door to a variety of new "miracle drugs" that have saved the lives of millions. Until the discovery of penicillin, the only treatments available for bacterial infections were quinine, arsenic and sulfa drugs. All of these were highly toxic (poisonous). Scottish bacteriologist Alexander Fleming (1881-1955) discovered penicillin by accident in 1928. While conducting research using several petri dishes of bacteria cultures, he accidentally left one of the cultures uncovered for several days. Fleming found the dish contaminated with a mold. He was about to discard the culture when he noticed that the mold was dissolving all the bacteria near it. Fleming recognized the importance of what was happening. He put a sample of the mold under his microscope and tested it against several types of bacteria. 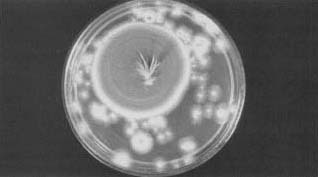 Fleming found that something in the mold stopped or slowed the growth of the bacteria. Because the mold was from the genus Penicillium, Fleming named the part of the mold that attacked bacteria "penicillin." He was unable to separate the penicillin from the mold, however. In 1935, at Oxford University in England, researchers Howard Walter Florey (1898-1968) and Ernst Boris Chain (1906-1979) stumbled across an article by Fleming about his work with penicillin. They obtained a culture (sample) of Fleming's original mold and were able to separate and purify the penicillin. Florey began testing the penicillin on animals and found that it was nontoxic (did not harm living cells) as well as an effective antibiotic. Furthermore, it did not interfere with the activity of white blood cells (the body's natural defenders against infection). Trials of the drug on humans were so successful that great quantities of penicillin were used to treat infections suffered by wounded and ill soldiers during World War II (1939-1945). England was not able to manufacture penicillin in quantity because of its involvement in the war. Florey traveled to the United States and convinced the government to sponsor research on the mass production of penicillin. An efficient method of mass-producing penicillin was developed using fermentation and a cornstarch medium. This basic technique is still used to produce many antibiotics. Penicillin prevented thousands of wartime deaths from gas gangrene and other infections. Now the race began to discover its molecular structure so that it could be produced synthetically (in a laboratory from its chemical compounds). A penicillin culture. Until the discovery of penicillin, the only treatments available for bacterial infections were quinine, arsenic, and sulfa drugs. open to other scientists to develop methods to synthesize it. Robert Burns Woodward (1917-1979), an organic chemist at Harvard University, completed the first penicillin synthesis in the 1950s. Penicillin is used to treat any number of infections, including syphilis, meningitis, and pneumonia. Penicillin has reduced the threat of bacterial infections. The capability to treat potentially life-threatening infections has permitted the development of surgical operations, organ transplants, and open heart surgery. It has also vastly improved the treatment of burns. Because the discovery and uevelopment of penicillin is rightly regarded as one of the greatest achievements in medical history, many of the scientists who worked on it have been highly honored. Fleming, Florey, and Chain shared the 1945 Nobel Prize in medicine for the development of penicillin. For their work with penicillin as well as other research, Hodgkin and Woodward also received the Nobel Prize, in 1964 and 1965, respectively. this article was very good and i got a lot of important details that i neeed to find out about alexander fleming and his discovery of penicillin. My name is chris and i am doing a national history day report on why the discovery of penicillin was a triumph in world history. I got a lot of the information that i needed to write and finish my research paper. This information is very useful to me. Because the concept is very cut short and read very easy. I am also doing a report on penicillin and this is so great!! It really helped me get information and I also learned new things. this site has some good information that can be used to make your own penicillin. This was a very helpful website. Thanks a lot for the information. However, it would be nice to know who wrote this article. good information.I want to use this in my paper, however the information needed to site this source is not available. You should put the name of person or group who wrote this and maybe date of publication too. I am in college and sources with this amount of information in it is wonderful.I love biology. Great information thanks it really helped me with my paper!!! I need just an brief story with details of the linage of how the penicillin was discovered, separated and purifed, studied in labs,it's synthesis and the scientist who were honoured for each major step. this passage surprisingly gave me that in a nut-shell. This site is truly amazing. It helped me to do my research paper. The information in here are clear and to-the-point. Thank you very much for this site. But it certainly would be nice to know the author and the date that is written. I finally understand what my teacher was trying to explain for two weeks. And now I'm ready for a giant test tomorrow. Thank you so much!! THe Website was very helpful to my History Project. Thank you! This has helped me tremendously in writing my paper. i am writing a paper for school and am having trouble filling space with information. Since i have already done my research i have seen this all before. Are there any interesting facts or information about how it affected medical history? otherwise this article was worded well. I would like to add that my father was a soldier with the U.S. Army during World War 2. Early in the War he was sent to Iceland where he lived in a nissan hut which served as barracks in a country that was very cold and dark all winter. This would be in 1942. During that time he contracted what was called "lobar pneumonia". The U.S. Army did not have any penicillin, my father almost died at age 25 from this infection. Students should understand that penicillin was not always available and was only minimally available in 1943.